In the past, I have not taken the winter as a time to collect items to make natural dyes. Perhaps it is the unnaturally warm winter we are having that has inspired me, but I have found myself looking around and wondering if I could extract dyes from what I am seeing. I have carried out two experiments so far. So, here is some lichen. This is available in profusion around Hanckley Common, where I frequently walk the dogs. It particularly likes dead wood but also seems to grow on living trees. Now I know that using lichen for dyeing is not encouraged these days because the plants are slow growing and increasingly struggle because of air pollution and the like. At Hankley, as I said, there is masses growing and it is more abundant this year then I remember it being for many years. So, I have taken a bag full to see if it will make a dye. I prepared the dye bath by bringing the lichen to the boil slowly in plenty of water. I simmered this mix for about an hour and then left to stand, for a week. After that I drained off the liquid through a sieve, squeezing the fibres to extract as much liquid as I could. Into the strained liquid I put some fine wool which had been wetted out and soaked in a vinegar mordent. This was then brought to a simmer just below a boil for about an hour. The outcome was a pleasant, soft sludge green. I think this would be worth repeating. The other material I collected from Hankley was bark from fallen birch trees. This too was brought to the boil in plenty of water and then left for a week. The resulting liquid was drained off and used as a dye without mordent, using the same kind of wool as I used for the lichen. The product is a soft yellow. It is such a gentle colour it scarcely looks dyed. I can think of some uses for this but am not sure that it was worth the effort. 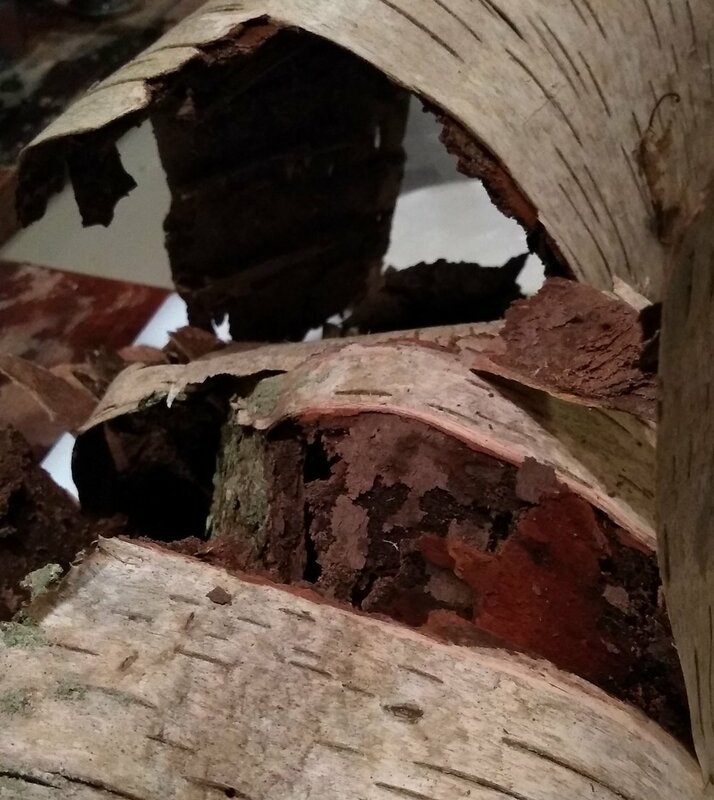 However, I have read more and think I used the wrong birch bark. I think I should have used the thin, papery bark that peels by itself from certain Silver Birches. There is a small group of Silver Birches in Farnham Park. In the high wind last week some of the peeling bark was blown off and I collected it from around the trees. This is now soaking for a week and I will see what colour I can extract. I am hopeful for pinks. More will follow here. There are still places left for the Natural Dyeing day on 9th and 10th February. Come along and work some of this magic for yourself.